The EPIRB1 from Ocean Signal is a safety device that all mariners should consider an integral part of their vessel. Whether you are an intercoastal navigator or an offshore fisherman the EPIRB1 will call help and assist in quick and accurate location if you need it. With a 10 year battery life the EPIRB1 negates the need for an EPIRB to have its battery replaced every 5 years to conform to safety regulations, of course battery life may be reduced by the number of times the EPIRB1 is tested. The size of the EPIRB1 is typically 30% smaller than most EPIRBs of similar capability, so required space for storing is lessened greatly, especially on a sailboat where space is critical. Designed with a quick release bracket the EPIRB1 was designed and built for quick removal in the event of an emergency. Automatic activation is also part of the EPIRB1 so if your vessel capsizes your position is sent automatically when immersion occurs however can also be activated manually if need be. With its 5 year warranty the EPIRB1 will be part of your vessel for a long time. The 66 channel GPS of the EPIRB 1 transmits your location quickly and precisely alerting search and rescue to your position for the fastest recovery time possible. Additionally the EPIRB1 has a homing beacon to direct the rescue vessels to your exact location to aid in final location. Every serious boater needs to be prepared for every emergency, and an EPIRB is one of the critical items that should be part of this preparation. 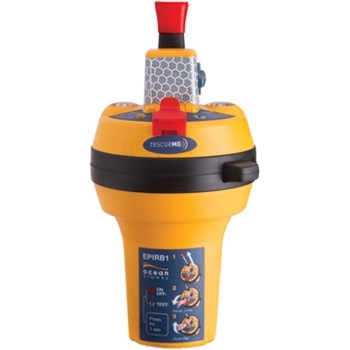 A sound choice for your vessel is the EPIRB1.